Seems like a pretty good price for this blu-ray boxset - the only time I've seen it cheaper was the amazon lightning deal at Christmas (and those went fast!). Also, if you buy anything else at the same time to take the total over £30, you can use code TDX-FCWL to get a fiver off! Still remember getting hooked on hukd when getting the Christopher Nolan bluray Boxset for about £11 18months ago. These three films plus Memento, inception and another. Still remember getting hooked on hukd when getting the Christopher Nolan … Still remember getting hooked on hukd when getting the Christopher Nolan bluray Boxset for about £11 18months ago. These three films plus Memento, inception and another. 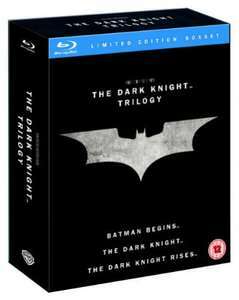 I'm hoping for a better Nolan boxset further down the line, though - that one was just a 'bung the individual blu-rays in a cardboard slipcover' job. Still remember getting hooked on hukd when getting the Christopher Nolan … Still remember getting hooked on hukd when getting the Christopher Nolan bluray Boxset for about £11 18months ago. These three films plus Memento, inception and another. Sigh. Those were the days. How did Bruce Wayne get back from India? Is being punched repeatedly in the back a better treatment than say spinal surgery and months of physio therapy? Is creating a big fiery bat logo a productive use of time when there is a nuclear bomb ticking away? *** HERE BE SPOILERS ****** HERE BE SPOILERS ****** HERE BE SPOILERS … *** HERE BE SPOILERS ****** HERE BE SPOILERS ****** HERE BE SPOILERS ***How did Bruce Wayne get back from India?Is being punched repeatedly in the back a better treatment than say spinal surgery and months of physio therapy?Is creating a big fiery bat logo a productive use of time when there is a nuclear bomb ticking away? 2. 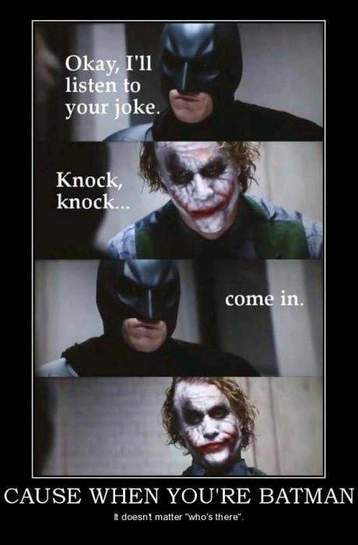 Yes, if you're Batman. *** HERE BE SPOILERS ****** HERE BE SPOILERS ****** HERE BE SPOILERS … *** HERE BE SPOILERS ****** HERE BE SPOILERS ****** HERE BE SPOILERS ***How did Bruce Wayne get back from India? Yep, The Prestige.I'm hoping for a better Nolan boxset further down the … Yep, The Prestige.I'm hoping for a better Nolan boxset further down the line, though - that one was just a 'bung the individual blu-rays in a cardboard slipcover' job. Yes, this one has the fold out case and the art book. The other one - the Christopher Nolan director's boxset of six movies - is the cheapo one.